Improving complementary feeding for babies, or giving foods in addition to breast milk, has led to significant reduction in the child mortality caused by undernutrition. A decrease in worldwide rate of mortality in children under-five by over 50 percent, reducing from 90 to 43 deaths per 1,000 live births between 1990 and 2015. A global drop in the number of children under-five deaths from 12.7 million in 1990 to nearly 6 million in 2015, despite the population growth in developing regions. Three-fold increase in the rate of reduction of under-five mortality since the early 1990s. The measles vaccination helped prevent almost 15.6 million deaths between 2000 and 2013, translating to a 67 percent decline in the number of cases of measles reported globally. The incredible drop in preventable child deaths in the last 25 years is truly one of the most significant achievements in human history. Preliminary estimates suggest that universal under-five mortality has dropped by more than 50 percent – from 90 to 43 deaths per 1,000 live births in that period. This translates to a major decline from 12.7 million deaths of children under five in 1990 to 6 million in 2015. Only Oceania has not achieved over 50 percent reduction in under-five mortality compared to other developing regions. Despite the achievements in most developing regions, the current trend is not sufficient to meet the MDG target for at least another 10 years. The universal advance in child survival is still elusive to many of the globe’s youngest children – as well as those in the most vulnerable situations. About 16,000 children under five continue to die every day in 2015, mostly due to preventable causes like pneumonia, malaria, and diarrhea. Another one million of the 6 million children who die before their fifth birthday take their first and last breath on the day they’re born. Another 1 million will die in the first week, and around 2.8 million will die within their first 28 days of life (the neonatal period). In the last 25 years, the universal neonatal mortality rate has dropped from 33 to 19 deaths per 1,000 live births, though this rate has been slower than the decline in mortality for children aged 1-59 months. Most neonatal deaths are caused by preterm birth complications (35 percent), complications during labor and pregnancy (24 percent), and sepsis (15 percent). In Southern Asia and sub-Saharan Africa, many deaths are also attributed to preventable infectious diseases and could be avoided with simple, high-impact, and cost-effective interventions. Mother’s education and residence – children in rural areas are 1.7 times more likely to die before their fifth birthday compared to those in urban areas. This is mostly attributed to the mother’s education, with children born of mothers with secondary or higher education nearly 3 times as likely to survive as those of mothers with no education. That said, mortality among the poorest households has been declining rapidly, probably due to the improving equality. Measles – deaths caused by measles have declined rapidly between 2000 and 2015, from 544,200 to 145,700 deaths, mostly among children under five. Estimates suggest that nearly 15.6 million deaths were averted by measles vaccinations administered between 2000 and 2013, though sub-Saharan Africa and Southern Asia are still the most affected by measles deaths. Reducing the mortality of children-under-five requires sound strategies, adequate resources, and political will. The MDGs have led to amazing, unprecedented gains in reducing child deaths, through improved service delivery, effective and affordable treatments, and political commitment. 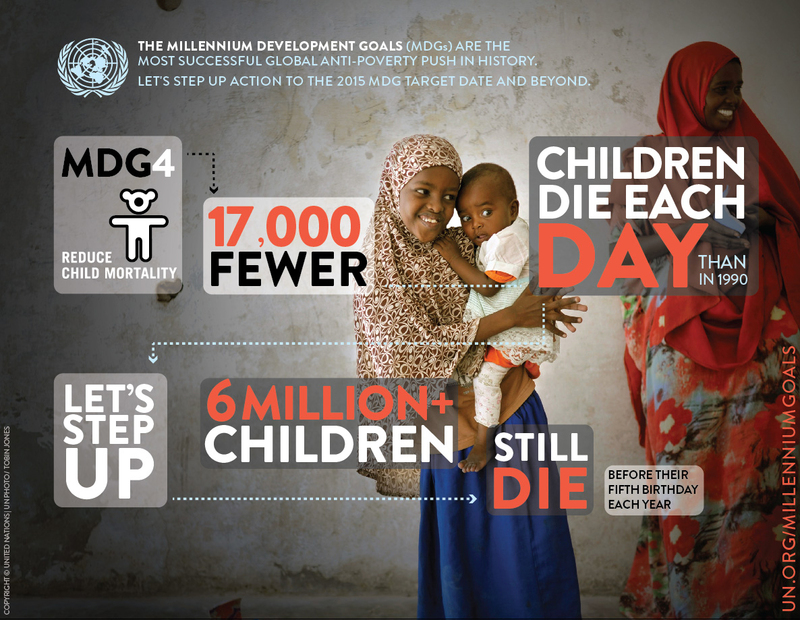 The achievement of MDG 4 by most developing countries shows that it can be done. And with 11 children dying every minute around the world before celebrating their fifth birthday, more needs to be done to improve child survival rates.